Malpelo Island (Spanish: Isla de Malpelo) is an island located 235 miles (378 km) from Colombia’s Pacific coast, and approximately 225 miles (362 km) from Panama’s coast. It has a land area of 0.35 square kilometres (86 acres). It is uninhabited except for a small military post manned by the Colombian Army, which was established in 1986. Visitors need a written permit from the Colombian Ministry of Ecology. 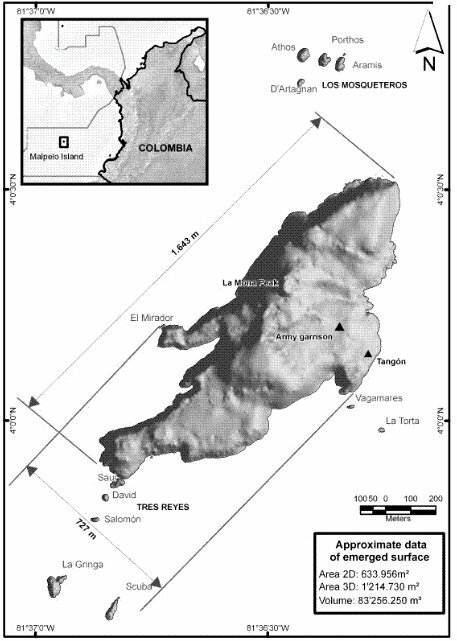 The island is part of Cauca Department. The island consists of a sheer and barren rock with three high peaks, the highest being Cerro de la Mona with a height of 300 metres (980 ft). The island is surrounded by a number of offshore rocks. Off the northeast corner are the Tres Mosqueteros. Off the southwest corner are Salomon, Saul, La Gringa, and Escuba. Malpelo Nature Reserve, a plant and wildlife sanctuary, is defined as a circular area of radius 9.656 kilometres (6.000 mi) centered at 03°58′30″N 81°34′48″W / 3.975°N 81.58°W / 3.975; -81.58. Malpelo is home of a unique shark population; swarms of 500 hammerhead sharks and hundreds of silky sharks are frequently seen by diving expeditions, making it a very popular sharkdiving location. Malpelo is one of the few places where the Smalltooth sand tiger has been seen alive, in the dive site “El bajo del Monstruo” it is frequently seen. Malpelo has been interpreted as a portion of oceanic crust, probably a local manifestation of a “hot spot”. It is composed mainly of pillow lavas, volcanic breccias, and Tertiary basaltic dikes. At first glance, the island seems to be barren rock, devoid of all vegetation. But deposits of bird guano have helped colonies of algae, lichens, mosses and some shrubs and ferns establish, all of which glean nutrients from the guano. On July 12, 2006, Malpelo was declared by UNESCO as a natural World Heritage Site. A Colombian foundation is trying to preserve the biodiversity of the site.